In Australia, "fixed-wheel" is the normal term for the subject of this article—meaning the opposite of freewheel, and "fixed-gear" usually refers to a single-speed bicycle. A fixed-gear bicycle (or fixed-wheel bicycle, sometimes known as a fixie) is a bicycle that has no freewheel, meaning it cannot coast, because the pedals are always moving when the bicycle is in motion. The sprocket, or cog, is threaded or bolted directly to a fixed rear hub. When the rear wheel turns, the pedals turn in the same direction. This allows a cyclist to stop without using a brake, by resisting the rotation of the cranks, and also to ride in reverse. As a rule, fixed-gear bicycles are also single-speed bicycles—bicycles without derailleurs, with a single sprocket attached to the rear hub, and a single sprocket attached to the crank. Most fixed-gear bicycles only have a front brake, and some have no brakes at all. Exceptions do exist: for example, Sturmey-Archer produces 3-speed fixed rear hubs for multispeed fixed-gear bicycles. Some road racing and club cyclists used a fixed-gear bicycle for training during the winter months, generally using a relatively low gear ratio, believed to help develop a good pedalling style. In the UK until the 1950s it was common for riders to use fixed-gear bicycles for time trials. The 1959 British 25 mile time trial championship was won by Alf Engers with a competition record of 55 minutes 11 seconds, riding an 84 inch fixed-gear bicycle. The fixed-gear was also commonly used, and continues to be used in the end of season hill climb races in the autumn. A typical club men's fixed-gear machine would have been a "road/path" or "road/track" cycle. In the era when most riders only had one cycle, the same bike when stripped down and fitted with racing wheels was used for road time trials and track racing, and when fitted with mudguards (fenders) and a bag, it was used for club runs, touring and winter training. By the 1960s, multi-gear derailleurs had become the norm and riding fixed-gear on the road declined over the next few decades. Recent[dated info] years have seen renewed interest and increased popularity of fixed-gear cycling. In urban North America fixed-gear bicycles have achieved tremendous popularity, with the rise of discernible regional aesthetic preferences for finish and design details. Fixed-gear bicycles are also used in cycle ball, bike polo and artistic cycling. One of the perceived main attractions of a fixed gear bicycle is low weight. Without the added parts required for a fully geared drive train, a fixed gear bicycle weighs significantly less than its geared equivalent. Also, a fixed gear drivetrain is more mechanically efficient than any other bicycle drivetrain, with the most direct power transfer from rider to the wheels. Thus, a fixed gear requires less energy in any given gear to move than a geared bike in the same gear. In slippery conditions some riders prefer to ride fixed because they believe the transmission provides increased feedback on back tire grip. Riding fixed is considered by some to encourage a more effective pedaling style, which is claimed translates into greater efficiency and power when used on a bicycle fitted with a freewheel. When first riding a fixed gear, a cyclist used to a freewheel may try to freewheel, or coast, particularly when approaching corners or obstacles. Since coasting is not possible this can lead to a 'kick' to the trailing leg, and even to loss of control of the bicycle. Riding at high speed around corners can be difficult for the novice rider, as the pedals can strike the road, resulting in possible loss of control. Many urban fixed-gear riders think brakes are not strictly necessary, and brakeless fixed riding has a cult status in some areas. Brakes and their cables are said to add extra bulk to the simple appearance of a fixed gear bicycle. Many riders claim that the experience of riding brakeless creates a "oneness with the road". Particularly in urban environments, it forces the rider to be more aware of their surroundings because of the inability to bring the bicycle to a stop quickly. Other riders dismiss riding on roads without brakes as an affectation, based on image rather than practicality. Riding brakeless can be dangerous, is prohibited by law in many jurisdictions, and may jeopardize the chances of a successful claim in the event of an accident. Australia – In every state, bicycles are regarded as vehicles under the Road Rules. By law, a bike is required to have at least one functioning brake. Denmark – All bicycles are required to have working brakes on both wheels, as well as reflectors and bells. France – To be approved for road traffic, a bike must have 2 brakes, 2 lights, numerous reflectors, and a ringer. However the laws are rarely enforced, and the sight of all kinds of non officially approved bikes is quite common. Germany – All bicycles are required to have working brakes on both wheels, as well as reflectors and bells. In Bonn a local court accepted that the fixed-gear mechanism was suitable back brake, but high-profile crackdowns specifically targeted fixies in Berlin, in an attempt to control what police described as a "dangerous trend"
A horizontal dropout on a steel frame road bicycle converted to a single-speed. The derailleur hanger (below the axle) and an eyelet (above the axle) for mounting a fender or rack, both integral parts of the original frame, are now unused. For a variety of reasons, many cyclists choose to convert freewheel bicycles to fixed gear. Frames with horizontal dropouts are straightforward to convert, frames with vertical dropouts less so. One method is to simply replace the rear wheel with a wheel that has a track/fixed hub. Another is to use a hub designed for use with a threaded multi-speed freewheel. Such a hub only has the normal right-handed threads for the cog and not the reverse threads for the lockrings used on track/fixed hubs. The sprocket on a hub without a lockring may unscrew while back pedalling. Even if a bottom bracket lockring is threaded onto the hub, along with a track sprocket, because the bottom-bracket lockring is not reverse threaded, the possibility still exists that both the sprocket and locknut can unscrew. Therefore it is recommended to have both front and rear brakes on a fixed-gear bicycle using a converted freewheel hub in case the cog unscrews while back pedaling. It is also advisable to use a thread sealer for the cog and bottom bracket lockring. The rotafix (or "frame whipping") method may be helpful to securely install the sprocket. A magic gear—the right math can calculate a gearing ratio to fit a taut chain between the rear dropout and bottom bracket. Also, using a chain half link and slightly filing the dropouts to increase the width of the slot increases the chances of finding a magic gear. It is worth noting that the magic gear setup is controversial, due to inevitable chain stretch and subsequent slippage that can lead to serious injury. "Run out" is the name for varying chain tension due to a lack of perfect centering of either/or the chainring or sprocket. Higher end components are often machined to higher tolerances and can assist with run out issues. There are many forms of competition using a fixed gear bike, most of the competitions being track races. Bike messengers and other urban riders may ride fixed gear bicycles in alleycat races, including New York City's famous fixed-gear-only race Monstertrack alleycat. There are also events based on messenger racing, such as Mixpression, which has been held nine times in Tokyo. Trick demonstrations have been held since the late 1800s in the US and Europe; while they continued into a competitive form in Europe (Artistic Cycling), subsequent to the recent[dated info] widespread popularity and advancement of fixed gear bikes, trick competitions have also now established themselves at venues in the US and Asia. European competitions include solo and team balletic movements on a controlled, flat surface; US and Asian competitions often include "park" and "flatland" styles and venues, a la BMX. Other competitions include games of "foot down" and bike polo. Maintaining a fixed gear is relatively easy because it has fewer parts than a geared bicycle. The sprocket should be checked regularly to make sure there is no damage to any teeth and that no object is grinding it as it turns with the rear wheel. The chainring should be checked similarly for any damage. The fixed-gear movement is spreading over the globe, and is growing in Sweden. A cornerstone of the Swedish fixed-gear society is the Internet based forum Fixedgear.se, with over 2300 registered members. This makes up for the main meeting ground and discussion forum for Swedish fixed-gear riders and enthusiasts. There are also several bicycle clubs throughout Sweden with a fixed-gear niche. Komet Club Rouler is a club based in Gothenburg, annually arranging Svart Katt and other fixed-gear oriented activities. Svart Katt has been internationally recognized and is considered Sweden’s largest alley cat by number of participators, according to Cog Magazine. KCR’s equivalent in Malmö is called Pista Malmø, arranging ”Thursday's rides” every Thursday, for all bikes and riders. Several factors contribute to the recent rise in popularity of fixed-gear bicycle. A rider from Stockholm interviewed for an article about the phenomenon notes that riding a bike imparts a feeling of freedom to the rider. You are free to go wherever you want, whenever you want. A sense of belonging is also important; as the rider says, "all who cycle are my friends". Riders unknown to each other commonly greet each other when on bikes. As in many subcultures, this feeling of belonging is a key factor in recruiting and retaining participants. Up till 2012 Fixed Gear Moscow organized numerous alleycat races, tournaments and other events to keep community growing. Several side projects were initiated by members of Fixed Gear Moscow and are still in development. 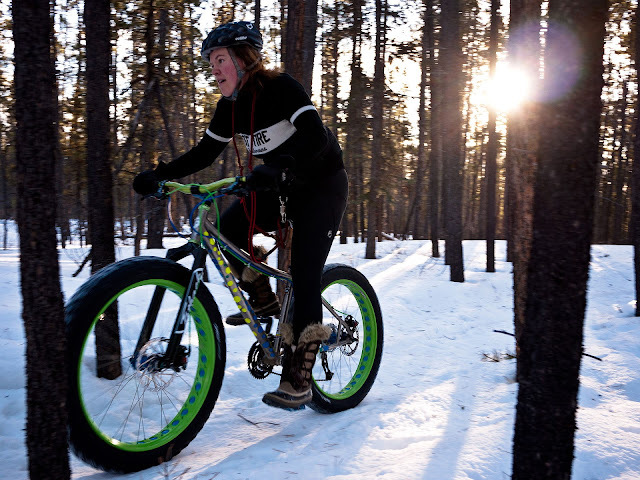 Fatbikes were invented for winter trail riding and racing in sub-arctic Alaska on the Iditarod Trail and simultaneously, for touring the deserts of New Mexico. They are extremely versatile bikes, capable of traversing diverse terrain types including snow, sand, desert, bogs, mud, pavement, or traditional mountain biking trails. In several states, fatbike-dedicated groomed winter trails have been created. Although early versions of fat-tired bikes were probably built on a limited basis as long ago as the early 1900s, the original fatbike was ridden in 1986 across the Sahara using fat tire prototypes from Michelin. In the late 1980s, Alaskan frame builders began experimenting with custom components and configurations designed to achieve a large contact patch of tire on snow. Steve Baker, with Icycle Bicyles in Anchorage, was welding together two rims and even three rims and built several special frames and forks that could accommodate two or three tires together. Roger Cowles (riding his famous "6 Pack"), Mark Frise, Dan Bull and one other rider rode the entire length of the Iditarod Trail from Knik to Nome in 1989. Simultaneously, in New Mexico, Ray Molina had commissioned Remolino 80 mm rims, 3.5-inch tires and frames to fit them. He wanted the bikes for his guided tour business in the soft sands of the Mexican and Southwest arroyos and dunes. Mark Gronewald, owner of Wildfire Designs Bicycles in Palmer, Alaska met Molina at the 1999 Interbike convention in Las Vegas and rode one of Molina's prototypes at demo days. In late 1999, Gronewald and another Alaskan frame builder, John Evingson, collaborated to design and build several bikes using Molina’s rims and tires. Gronewald and Evingson then began producing their own separate lines of fat-tired bikes in 2000. Rims and tires were imported to Alaska where Wildfire and Evingson began making small, handmade production runs and custom-ordered frames built around Remolino 80 mm rims and 3.5-inch tires. Gronewald coined the trademark "Fat Bike" in 2001 and used it as the model name for his bikes. Gronewald originally worked with Palmer Machinery for welding and later contracted frame building to Mike DeSalvo at DeSalvo Cyles of Ashland, Oregon. Gronewald continued to sell his original fatbikes until 2011. Gronewald's design featured an 18 mm offset wheel and frame built to allow full range gearing, since he was using standard hubs and bottom brackets available at the time. Wildfire and Evingson bikes were used in the Iditarod Trail races beginning in 2000. Also that year, Mike Curiak from Colorado set a record on the Iditarod Trail in the IditaSport Extreme race to Nome on a modified Marin bike with Remolino rims and tires. Surly Bikes released the Pugsley frame, in 2005, and began producing Large Marge 65 mm rims and Endomorph 3.8-inch tires in 2006. The Pugsley frame, rim and tire offerings made fatbikes commercially available in local bike shops worldwide. The Pugsley bikes also featured the offset wheel and frame build. Other early versions of the fatbike were normal mountain bikes equipped with SnowCat rims, created by Simon Rakower of All-Weather Sports in Fairbanks, Alaska in the early 1990s; or with multiple tires seated on two or three standard rims that had been welded or pinned together. Rakower was involved with technical support aspects of the Iditabike (later IditaSport) race, which started in 1987. Since 2002 the race continued on the same trail under the name Iditarod Trail Invitational (ITI). Rakower started hand making extra wide rims for participants by welding two rims together and cutting off the middle ridge known as the snowcat rims 44 mm. S. Rakower produced those rims from 1991 through 1999. Many riders on the Iditarod Trail used a Geax tire with the snow cat rim. Enthusiasts would cut and sew tire-carcasses together to maximize the size of the tire and utilize all the available space between the seat stays and chain stays; this tire and rim combination would maximize the bicycle's footprint, increasing flotation on winter trails. Soon after, Rakower decided to design a 44 mm rim from scratch and had it produced. SnowCats revolutionized winter cycling, as they could be fitted to nearly any commercially available mountain bike. Mike Curiak from Colorado set a record on the Iditarod Trail in the 2000 race to Nome. Surly Bikes released the Pugsley frame in 2005 and began producing Large Marge 65 mm rims and Endomorph 3.8-inch tires in 2006. The Pugsley frame,rim and tire offering made fatbikes commercially available in local bike shops worldwide.The Pugsley bikes also featured the offset wheel and frame build. Fatback Bikes came online in 2007 adding the carbon Corvus fatbike. Another Alaskan brand 9:zero:7 joined in 2010 also offering a carbon fatbike now. Borealis Bikes was started in 2014. Other bike manufacturers have also entered the fatbike market recently including Trek, with the Farley, Salsa with the Beargrease and Mukluk, and Specialized with the Fatboy and On One with the Fatty. Others followed since 2014 Rocky Mountain, Felt, Kona, Pivot and many more. In December 2012 Eric Larsen (Polar Explorer) attempted to ride a fatbike to the South Pole. He made it a quarter of the way before he had to turn around. In 2013 and 2014 there were three cycling expeditions to the South Pole. Maria Leijerstam became the first to cycle to the South Pole, across the South Pole Traverse road. She rode a tricycle with fatbike tires. Juan Menéndez Granados skied and rode a fatbike to the South Pole. On 21 January 2014 Daniel P. Burton became the first person to ride a bike across Antarctica to the South Pole. Burton started at Hercules Inlet, and biked 775 miles to the South Pole. He rode on a carbon fiber Borealis Yampa fatbike with 4.8-inch wide tires. The Iditarod Trail Invitational (formerly known as Iditabike and Iditasport Extreme and Iditasport Impossible) race in Alaska has grown into an international event and is the holy grail of fat biking events, offering a 130-mile, 350-mile and 1000-mile distance. The event spurred the creation of many other winter ultra events in the United States, Canada and Europe that are accepted qualifiers to get into the Invitational.